Some people use sandpaper from 200 grit to 2000 grit to polish the aluminum. Some have also used a "Power Ball" for the final mechanical polish. to polish my lowers. My 1/4 hp grinder is a little weak to keep up the RPMs to build heat from friction to allow the compound to work. I did not spend too much time on it and used the standard hand polish medium to get a nice shine. I tried to use "White Rouge" for the final bright shine but it did not work for me. Probably caused by the under powered bench grinder. With a sock and just about any polishing compound it really cleans up nice and shiny. Buffing wheels, compound, a rake to clean the buffing wheel surface and a grinder are things needed. Last edited by Hans&Feet; 10-12-2017 at 07:42 AM. started doing it in 1973.. many bikes.. many parts..
second to final polish.."0000" steel wool... and white diamond.. then soft cloth and white diamond. rangers4u and nate6966 like this. 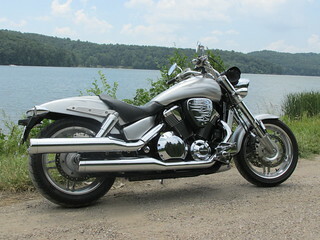 2005 VTX1800 F, type II, Silver Tribal, 86,000 Miles, Purchased Feb, 2005. MTC clutch & springs.. K&N Air Filter. Garmin 2597 GPS. 2007 VTX 1800 F Spec 3 - Mustang Seats, Cobra Angled Slashcuts, House of Kolor Blueberry Pearl paint and custom tank badge, lots of chrome, lots of sanding and polishing on the aluminum! even the aluminum saddle bag racks were polished...floorboards... etc. While wheel is rotation, apply the compound in a semi-circle motion to the edge. Light pressure and 2 to 3 passes across the face of the buff is all that is required. If the face of the buff becomes hard or is leaving streaks on the part, the buff needs to be raked. Raking the buff will also keep the buff balanced. If a black deposit of compound develops on the part, the part is not hot enough. The part should be hot enough that you can not touch the area that you are buffing with your bare hands. Cotton gloves are necessary to hold the hot parts. For deep scratches in stainless we recommend our Sisal Wheel with the Emery Compound. This is a very aggressive combination and is 3 to 4 times faster than the Spiral Sewn and Emery Compound combination. Emery Compound application to the Sisal Wheel will be every 30 seconds because the wheel holds the compound on the face of the buffs versus soaking in like cotton buffs do. This will leave light scratches and will need to be followed up with the Spiral Sewn and Emery Compound. The Spiral Sewn Wheel or Firm Airways are used with the Emery of Tripoli Compounds and will remove light scratches in your stainless or aluminum. Compound application will be every 30 to 60 seconds. If this combination does not remove the scratches you will have to sand out the imperfections and start the buffing process again. Use the Canton Flannel or Soft Airway buffs with the Blizzard White or White Rouge to bring your part to a mirror finish. Compound application is about every 30 to 60 seconds. Generally most parts are buffed with an up and down motion of side to side motion until the part is ready to be finished. An upward stroke, which is a motion that pulls the part upward against the rotation of the buff is more aggressive and is know as a cutting stroke. A downward stroke is a motion that moves the part in the direction of the rotation or towards the floor is a finishing stroke and will leave the part the shiniest. The downward stroke will also remove most compound haze and leave it the cleanest. Don't mix compounds on buffs. Once a compound has been used for a buff, that buff is dedicated to that compound. Mixing compounds on a buff will result in a cloudy finish. Location: 2007 VTX1300r. orange county New York. Hans and feet ... nice job. I’m going to do that too. It's not the speed....it's that sudden stop. 5 Attachment(s) What risers do I have?